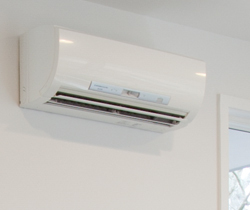 Here are four advantages of considering ductless cooling systems for your home. Ductless cooling systems can be installed in home additions, new construction, condominiums and apartments, or to improve temperature control in specific rooms. Also known as split systems, multi-split systems, or split-ductless systems, ductless cooling systems offer home and business owners a cost-effective way to replace inefficient window units. Traditional HVAC systems with air ducts must be professionally cleaned on a regular basis. Even after cleaning, dust and allergens are left behind. Ductless systems, on the other hand, offer multi-stage filtration that can reduce dust, bacteria, pollen, allergens and other particulates in the air. Installation of a traditional, ducted system can take weeks and will disrupt everyday activities. Ductless systems are far less invasive to install, and depending upon the number of units required, can be up and running in as little as one day. Keep your home cool all summer. Call us 800-736-4929 to learn how.